BOOK WEEK is here! It's a time to celebrate our favourite books and immerse ourselves in the joy of reading. The CBCA winning books have been announced and children all over the country are getting their Book Week costumes organised. Teacher's are planning their lessons - and with the help of Teach Starter, I've found some fantastic resources you might like to check out. A very imaginative theme, as we explore how books allow us to escape into another world. Kicking off this collection of resources with a classroom banner - giving students a starting point for their thinking about the theme. Will they escape to outer space or into a fairy tale castle? A great story writing prompt or story book investigation. 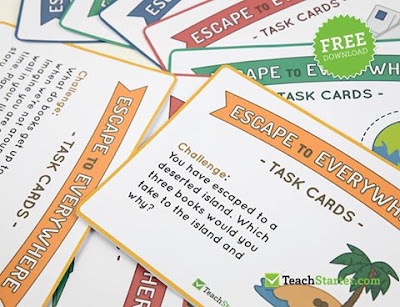 These Task Cards from Teach Starter are perfectly aligned with the theme, and are fantastic for extending students' critical and creative thinking. Just one example is to choose a story book and illustrate the map of where the story takes place. This pack comes as a set of 10. Instagram followers may have seen my Escape to Everywhere poster I made during a Professional Development evening - I must say I really enjoyed the opportunity to reconnect with my former student-self and do some art. Go Home Cheeky Animals! 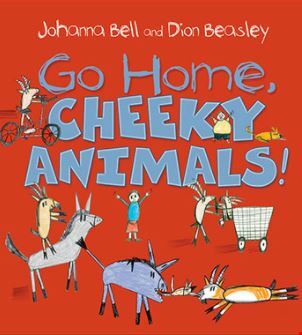 is the follow up story to Too Many Cheeky Dogs, written by Johanna Bell and illustrated by Dion Beasley. A story set in the northern part of Australia where the climate is quite different to that of the four seasons that we are used to. Child like illustrations appeal to a young audience, and interestingly I discovered (after I did a bit of research), the illustrator is profoundly deaf and has muscular dystrophy. Set in a small indigenous town, where there are more dogs than people, several other species of animals begin to invade the town - and no one can stop them! 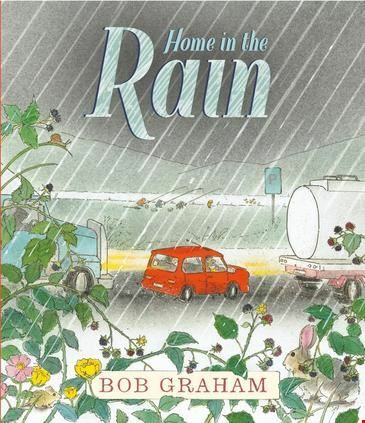 I read Home in the Rain during a relief teaching day I did as the teacher-librarian so I actually read it four times in the one day! A very simple thing such as driving home from Grandma's house on a rainy day, actually becomes a very significant event in this family's life. An ordinary moment between a mother and child becomes something that they will both surely remember forever. Gorgeous tiny details such as the rainbows made from oil and water combining on the bitumen are captured beautifully. A worthy winner of this honour! Sometimes we want to find a reading resource that will suit for any book. 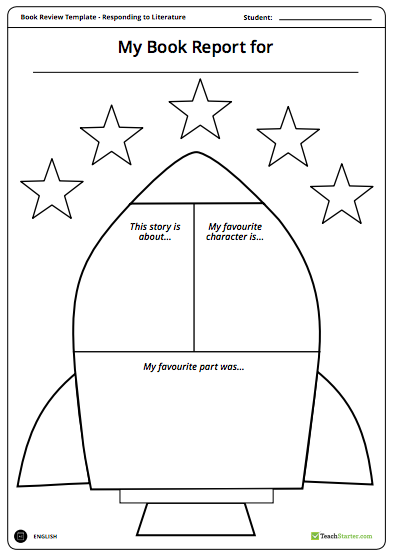 This 'rocket' book report would be ideal for reviewing any of this year's short listed books. The fantastic thing about this resource is that there are three different versions to suit different ability levels. Plus the rocket is a way to 'escape' - thus forming another link with the Book Week theme. I really love the look of these reading comprehension strategy question cards - which again could be used for any of the short listed books, or simply during reading lessons. There are 120 of them covering a variety of skills such as comparing, predicting, recalling facts, questioning, inferring and summarising. 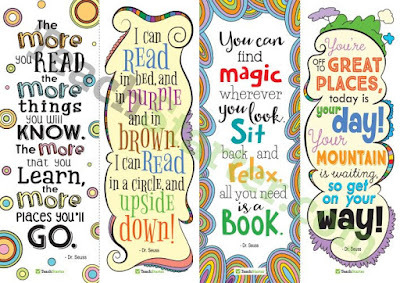 I found some awesome book marks on Teach Starter - these Dr Seuss quotes are so fun and colourful, and there's also a fantastic J.K. Rowling quote "I do believe something very magical can happen when you read a good book.". Perfect for all ages, not just the Harry Potter fans! Finally, something I usually do every year during book week is make these mini books. All it takes is a single piece of paper, some clever folding and one small snip. They have so many uses! Write letters, numbers, sight words, draw pictures, write a story... Check out this video for the tutorial. Another nifty little trick with paper is to create a "triarama" - similar idea to a diorama, except it's kind of like an open pyramid made from a piece of paper. I'm keen to try this one out, and get the students to create the scene from one of the shortlisted books. Here's how to make them! Now if you are still looking for some costume inspiration - Claire from Life on Wallace and her boys pulled out all of the books which suited the theme from their book shelf and she compiled this fantastic list of simple costumes! Ok well I think that's it from me for this post! Happy Book Week everyone!